The Winters Group supports organizations in developing a diversity, equity, and inclusion strategy that is aligned with and embedded into the organizational culture, mission and goals. We encourage our clients to view their Diversity, Equity & Inclusion (DEI) strategy as a journey, and typically recommend a three-year plan, consisting of top-down and bottom-up efforts. The strategic plan includes goals that link organizational business outcomes with DEI results, as well as goals that call for systemic change through individual approaches to education & learning. 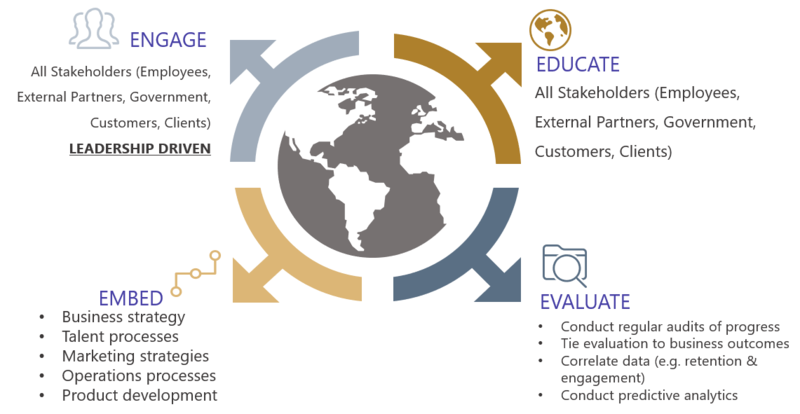 Our 4E Model for DEI Strategy (shown below) includes engaging all necessary stakeholders, identifying measures to evaluate current and future programs, implementing DEI education and embedding the strategy into existing business processes and strategies. “Hillside Family of Agencies has partnered with The Winters Group on a comprehensive Diversity and Inclusion journey. We have found this partnership to be best in class. They have proven to be a clear thought leader in this space enabling clear guidance, advice and feedback. Leadership development has been instrumental to this effort and The Winters Group has lead open, challenging and break through dialogue with leaders on their role .